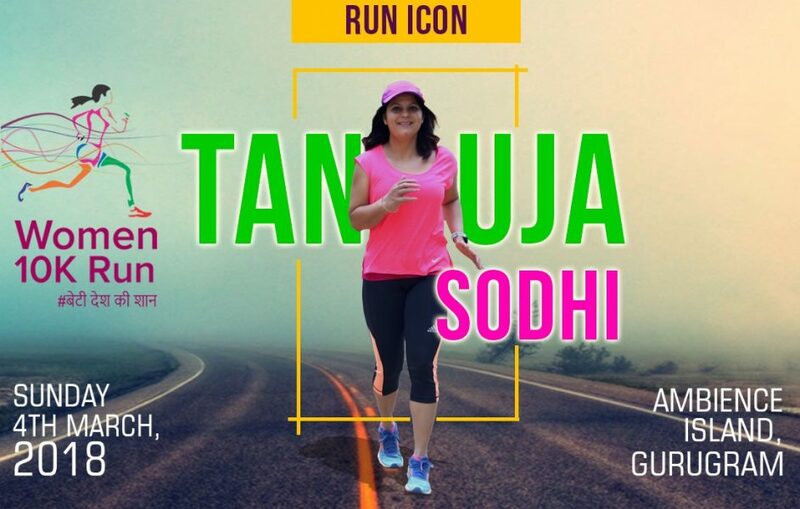 Because it’s high time women realised that Fitness is their only everlasting Wealth – I have on the blog today – Tanuja Sodhi. A woman who had nothing to do with Fitness for most part of her life and today has built her bones and a career around it! Currently, she is actively promoting the Women’s 10k Run in NCR Region. The Registration Link to it is here. Tanuja : Fitness didn’t come naturally to me. I had never played any sport in my growing up years and was totally ‘unfit’ in every sense of the word. It was only in 1992 when I joined the Indian Navy that the physically rigorous lifestyle swamped me completely without giving me a choice. While the armed forces tenure helped me stir up the fitness bug lying latent within, it was only in 2005 that I took a plunge into the fitness space by getting myself certified as a Reebok fitness instructor. What followed was my tryst with varied fitness activities, such as- aerobics, functional training, strength training, cardio kickboxing and yoga. I then set up my fitness studio and rejoiced in taking group fitness classes for more than a decade. I stumbled upon the sport of running in 2008 when I noticed a commercial promoting the first ADHM. It caught my fancy and I decided to commemorate my 40th year of existence by running my first half marathon in Nov, 2008. Then followed a spate of running events and I ran various half and full marathons and a 50k ultra marathon. Not to be appeased just by running, I started dabbling with high altitude trekking, which has now become an annual affair for me. I had long been fascinated by the tribe of triathletes and had secretly longed to become one. There was only one problem- that I had never cycled in my life. I bought my first bicycle two months before my first triathlon in 2015. After a sprint and an Olympic distance triathlon each, I set my eyes on Ironman 70.3 triathlon, which I successfully accomplished in Oct, 2017 in Kolhapur. I’m presently training for an international Ironman 70.3 to be held overseas this year. So, fitness is my addiction and is an integral part of my daily routine. It is my sweet tooth that gives me a fervent high and keeps me energized through the day. Tanuja: I run, swim, cycle six days a week in different combinations, while I strength train 2-3 times a week. I try to throw in a session of yoga once in a while to keep my body flexible. Tanuja : To support my endurance training, I try to consume more than half of my daily calories through complex carbs like brown rice, multigrain roti, vegetables, dried beans and sweet potato. For quick energy boost, banana, dates and figs are my go-to foods. To piece together all the cracks and crevices in my muscles left by strenuous exercising, I strive to add protein to all my main meals in the form of whole eggs (everyday), chicken, fish, soymilk, lentils and legumes. For my general wellbeing, I eat good fats such as seeds, nuts and nut butters. For hydration, it’s coconut water all the way, besides a few litres of good old H2O every day. It’s never too late to embrace fitness and start exercising. Your body will adapt to the rigours soon, if you start out slowly and progress gradually. Pursue any fitness activity of your choice that drives you and makes you jump out of bed, such as- running, yoga, cycling, swimming, zumba and strength training. This way, you’re more likely to follow it regularly without giving up midway. Eliminate white devils such as sugar, white flour, white rice and white bread from your diet. This is a fail-safe way of losing unneeded fat and being healthier. Get under the scanner regularly. Get medical check-ups done annually to rule out cancers and other health complications. What gets measured gets managed.